this animation the story of everything was made by rich and submitted as a piece of work on the cms pioneer course i am teaching as a timeline telling the bible story - wonderful! worship trick 8, series 4.
we have 3 amazing new animated parables on proost this month. they are the lost son by joel baker, benny the boss by jon birch and the gaga samaritan by andi mac. watch the promo below to get the flavour. this project is a partnership with stapleford house who will be producing lesson plans for secondary schools to use with the movies at the beginning of 2011. you can download the movies through proost and if you are a proost subscriber they are in the download section on the site. animated parables promo from jonny baker on Vimeo. stash is a monthly dvd zine of animations, motion graphics, visual effects with a mix of short films, music videos, virals and ads. i was given issue 65 so it's clearly been around a while. each year they also produce a dvd of the best of that year and have a number of collections. if you are familiar with onedotzero it's in a similar vein - creatively brilliant and a wide range of styles. there are a number of beautiful short films on the issue i've got. one of the simplest and my favourite is lucky, a sad lament for the way we humans treat fellow creatures on the planet, especially whaling. the good news is that the film is online at hybworks.co.uk. click on lucky on the left hand column under short films. there are a number of other short films there which i haven't yet looked at - let me know if you find any gems. 9 Lessons is a wonderful new flash animation from jon birch of asbojesus fame. it is incredibly simple an idea. run the flash file (in a browser or flash player) and there are 9 animating loops corresponding to each of the nine lessons and carols from the traditional christmas service. but here's the brilliant part - each one loops for as long as you like while you do the reading and whatever else. then you simply click on the play button in the corner to move on to the next image. it's only £2.99 and is this year's offering from proost into the ever expanding creative melee of ideas as the worldwide body of christ goes crazy to celebrate the coming of jesus the god/human into the world. it's probably obvious but these resources are as useable round a meal table or in your lounge with a family and friends as they are in a worship service. use with creativity and imagination! anyway hope your own creative juices are flowing and that of your communities. i'll be blogging other ideas and stuff that's out there as the weeks go by. i am making 9 lessons a worship trick - no 75 in the third series - as i love it so much. andi mac was a discovery on proost two years ago as one of our unusual suspects. it's been exciting to see his movie making/animation going from strength to strength. at the proost events at greenbelt he showed a new movie he has made i love elvis, another contemporary parable. you may remember sea parable in a similar vein and he has done clouds, vampire love and a movie for last year's nine on proost (see the movie section of the site). well the good news is that it is available free from the guys at kore to download. i'm hoping that we will be able to add it to proost as well at some point, at least for subscribers but the main thing is you can find it and it's free! congrats joel on getting a distinction in your art foundation! yay!!!! and here's his reel if you want to get a flavour of the movie stuff. the end piece should be worked up on proost for july we hope! Reel from cntrst on Vimeo. it's good friday so we thought we'd throw up one of proost's pieces for free. this is party because there was a glitch in the file we uploaded originally so some people have had problems downloading it so we feel bad for messing a few people around. and because we felt like putting something out there on good friday anyway. to view this i have embedded it full size so stretch your browser window so that the whole animation is in there and then you click through the slides on the bottom right. if your window is too small, download it - see below. the movie 12 stations is a great accompaniment if you haven't seen it. thanks jon for agreeing to give the meditation away. if you've paid for it already and feel hard done by e-mail me and i'll create a coupon for you to download something else. if you are a proost subscriber you could access this anyway. you can download it here and use it either with flash player or open it in a browser if you want to use it offline. Cafe Church Glebe is meshing art with technology as a way of enriching their gatherings for worship. 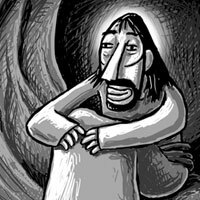 From 2002 - 2003, Cafe Church employed a digital artist, Rick Bull, who produced animations - prayers, scripture passages, visualised themes. We have been using these as a regular part of our worship.Think of them as contemporary stained glass windows in motion. This program continued in 2004. Cafe Church secured the services of Rob Thwaites (theatrical practitioner, digital artist) as Arts Facilitator, and Cameron Semmens (performance poet and wordsmith) and Pete Harding (musician and digital artist) as Artists in Residence. si smith has done a comic strip 40 of jesus journey into the wilderness. this was used by revive at greenbelt last year. i missed it there but first saw it at the IASYM conference in january when simon hall led some worship. he used the comic strip in a powerpoint presentation played over a track off revive's first album beautiful day (can't remember which one). si used to be part of the group that has become maybe (an understated name if ever there was one) in oxford, though he has now moved to leeds and joined revive.